Crafted of stainless steel with cast metal and polycarbonate handles. Presented with wood wall mounting featuring graphic motif of Tauriel. As Captain of the Woodland Guard in Peter Jackson's The Hobbit movie series, Evangeline Lilly's Tauriel carries signature twin daggers with blades forged of a bronzed alloy and a sylvan steel edge of superior strength. 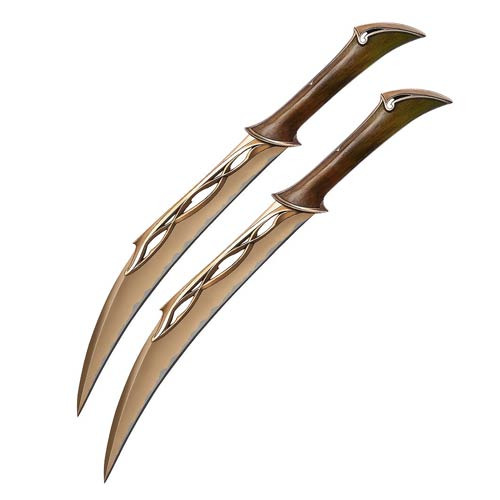 Those very daggers can be yours with The Hobbit Fighting Knives of Tauriel Prop Replica! The hilts are crafted from greenwood with bronzed steel fittings. The replica is crafted of stainless steel with cast metal and polycarbonate handles, precisely detailed and colored to exactly match the movie prop. The 20 1/2-inch long prop replica is presented with a wood wall mounting featuring a graphic motif of Tauriel, and the collectible includes a certificate of authenticity.